For pilots, there's a definite love-hate relationship with the Hobbs meter in an airplane. But what about Tach time? And what's the difference between Hobbs and Tach time? The Hobbs meter is a little set of numbers in the cockpit of aircraft that tells the pilots how many hours the engineer, the master switch has been running. Let me explain. Since pilots are charged per hour of flight time, the Hobbs meter typically represents money spent while renting an airplane. Each changeover of the numbers on the Hobbs meter means more money out of your pocket. But for pilots in training and other pilots working on building flight time, the Hobbs meter also tells them how many hours to log. A lower Hobbs time at the end of the flight may save a student pilot money, but higher Hobbs time means the student must log more hours to meet the training requirements or build more time. There's that love-hate relationship again. Seasoned pilots know a few tricks of the trade when it comes to saving on Hobbs time - like not starting the aircraft engine until all possible checklists have been completed and until necessary for flight. You'll probably never see a pilot start the engine and then sit on the ramp organizing his charts or planning his route. Well, you aren't likely to see an experienced pilot doing this, anyway. No, pilots will usually make sure to accomplish any, and all possible items that can be completed before the engine is started, all to save time and money! But wait, what about the Master switch? I thought the Hobbs time ran anytime the master switch was turned on? It could be the case, as well, if your mechanic has hooked the Hobbs meter to the master switch. So you may want to inquire about that before you rent if this topic matters to you. The Hobbs meter in small aircraft is a small set of numbers that are connected either to an oil pressure switch or to the batter or alternator (hence, the master switch method of monitoring Hobbs time). 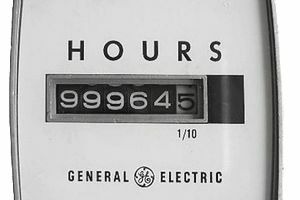 The Hobbs meter is activated when the engine is running (or when the battery/alternator switch is turned on) and assists in calculating the time in hours and tenths of hours. Tach time is similar to Hobbs time but instead of measuring actual hours that the engine is running by using oil pressure or alternator activation, Tach time measures engine RPMs. It means that the Tach time cycles through the numbers slower at idle and low throttle settings, and faster at higher power settings. Tach time is the preferred method for logging engine time for maintenance purposes, and it's also used at some flight schools as a rental charge method. The use of Tach time encourages students and aircraft renters to utilize lower power settings instead of higher power, which is easier on the engines and more fuel-efficient. Most FBOs and flight schools use Hobbs time for charging customers an hourly aircraft rental rate and Tach time for maintenance purposes. Some FBOs and flying clubs still use Tach time. For general aviation aircraft, the difference between Hobbs and Tach time can be up to 20 percent. When renting an aircraft to private pilots and other customers, most FBOs will require you to sign a form with the beginning and ending Hobbs and/or Tach times for your flight. They FBO staff will charge you based on the appropriate time (usually Hobbs), and you'll use the Hobbs time to add the flight hours to your logbook.